Churches across the country are encouraging donations of a different kind today as vicars and congregations celebrate World Blood Donor Day with their local communities; inviting people to register as blood donors and arranging parish visits to local blood donor sessions. Drawing National Blood Week to a close, it is the first time that World Blood Donor Day has fallen on a Sunday since 2009 and churches are using the opportunity to raise awareness of blood donation needs among the estimated six million regular churchgoers in the UK. The push comes in response to figures released last week by NHS Blood and Transplant, revealing that 40% fewer new volunteers came forward across England and North Wales to give blood last year compared to a decade ago. Highlighting the advocacy and support of UK churches, new research released today by the fleshandblood campaign, found that close to 10% of Christians gave blood in 2014, compared to around 4% of the general population who have given blood in the last two years. Launched in 2012, fleshandblood is the first national initiative between the Church and NHS, encouraging Christians to consider blood and organ donation as a part of their giving. Today’s release of survey results finds that, in the two years since the campaign’s launch, there has been a 77% increase in the number of local churches that talk about blood and organ donation alongside an accompanying increase in new donors from within the Christian community*. National church denominations, including the Methodist, Baptist, URC and Anglican churches also took part in NHS Blood and Transplant’s own #missingtype campaign during National Blood Week by removing the letters A, B and O (the letters that make up the blood groups) from their logos to help raise awareness for the need of new donors. 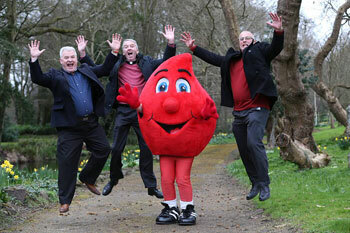 The ﬂeshandblood campaign has already witnessed widespread support across churches, community groups and from government ministers, with over 35,000 church leaders across the country having been resourced and registering some of the most successful recruitment drives for new donors in the history of NHS Blood and Transplant. The impact also led to the February 2015 launch of fleshandblood Ireland in Armagh Catholic cathedral and collaboration with other faith groups working on similar concepts, who are being supported by the organisers of the campaign. The ﬂeshandblood campaign has been sponsored by Give.net in association with denominations and organisations including the Catholic Bishop’s Conference of England and Wales, Church of England, The Salvation Army, The Methodist Church, United Reformed Church, Baptist Union of Great Britain, Church In Wales, Church of Scotland, Church in Ireland, Methodist Church in Ireland, Seventh Day Adventist Church, Hope and Evangelical Alliance. *Research conducted by ‘Christian Research’, December 2014, in a survey of 2,024 representative UK Churchgoers comparative to a corresponding ‘Christian Research’ survey of 3,171 representative UK Churchgoers in December 2012, prior to the launch of the fleshandblood campaign.